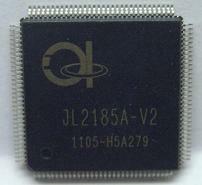 The JL2185A_V2 is a high image quality, high integrated, and low cost SOC for Digital Still Camera (DSC) and entry level Digital Video Camcorder (DVC) applications. It is targeted at the application of DSC resolutions up to 16M pixels. It has embedded with video input interface, high quality image processor, face-detection engine, JPEG codec, audio codec, memory card controller, video output interface, and USB 2.0 High-speed controller with embedded transceiver to make a low cost DSC/DVC easy to be realized. The JL2185A_V2 is capable of storing JPEG compressed pictures on storage media devices such as SD/MMC memory cards, SLC/MLC NAND flash, and serial NOR flash. It also supports such as TV display, LCD panel display, audio recording and playback, and face detection. Fully supporting major DSC/DV peripherals, customer can design DSC/DV system with minimum cost. n Support baseline JPEG codec compression and decompression. 傑霖科技股份有限公司 版權所有 © Copyrights 2006.